Seldom have I ever seen a medical ‘professional’ so self-concerned, so lacking in basic human concern for the possibility of carrying a pandemic to millions. Sorry, dear, above all, DO NO HARM! Our reader, Azgirl, examined certain words in Kaci Hickox’s 874-word screed. How many times did she refer to herself? How many times did she refer to America or the U.S or our country, public safety, citizens, or the welfare of 312 million Americans? Reader Blue Sky also notes something rather interesting. 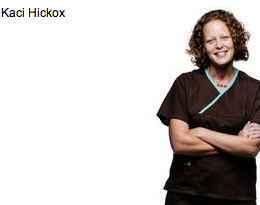 Kaci Hickox is not a present employee of Doctor’s Without Borders, as the short introductory bio in the article might have suggested. Kaci Hickox, a nurse with degrees from the University of Texas at Arlington and the Johns Hopkins University, has been caring for Ebola patients while on assignment with Doctors Without Borders in Sierra Leone. But she is actually a CDC employee, you know the CDC who, along with President Obama, has been fighting the concept of travel bans and quarantines on travelers from Ebola-affected countries. applied epidemiology, biostatistics, public health surveillance, scientific writing, and working with the media, as well as emerging public health issues. 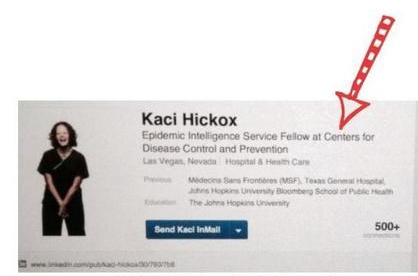 Here is a link listing her as an EIS ‘officer’ for the CDC. Hickox’s article was updated since our piece to include that her cowriter Dr. Yasmin “worked with Hickox as a disease detective with the Centers for Disease Control and Prevention.” Both Yasmin and Hickox worked for CDC so it is not clear from the writing if that means Hickox, Yasmin, or both (although it still fails to note Hickox’s involvement in advocacy and media relations). They may have picked up on our article. Here’s part of the LinkedIn page she deleted.